Bring New Orleans realness to any event. 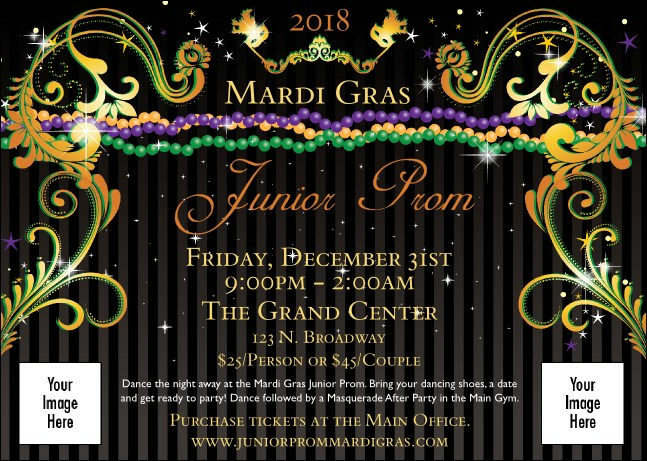 Birthday, prom, Super Bowl or even Fat Tuesday itself, the Mardi Gras Beads Club Flyer is the way to inform your guests about your get together. Printed in bright colors on a black background, this fabulous mailer features glittering chains of beads and sparkling Fleur de Lis inspired designs. Share your event information with custom text.